During school vacations, it is a time for the younger generation to relax and enjoy their holidays, and an excellent pursuit is with the Youth Summer Sports organized by the Department of Student Affairs at Rajabhat Institute Chiang Mai. Another exciting basketball game tips off in the Youth Summer Sports. The activities aim to encourage students to spend their leisure time with sports and exercise, and is one of Rajabhat’s community programs. 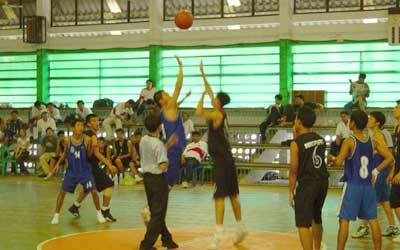 There are about 1,000 youth sportsmen from many schools including Monfort College, Dara Academy, Prince Royal’s College, Yupparaj Wittayalai School, CMU Demonstration School, Sacred Heart College, Wattanothai Payap, Rungsee Wittaya, Chiang Mai Kanawit, Sankamphaeng School, Phayao Wittayakom, Samakkhee Wittayakhom Chiang Rai, Suanboonyopatham Lamphun, and Patal Banthi Lamphun. Of the sports, football is a big hit, with matches starting every day at 10 a.m., and basketball games, which start at 9 a.m., have also attracted large participation. The football semi final will take place on the Rajabhat football ground on April 28th at 1 p.m. and the final match will be on April 30 starting at 10 a.m. In basketball, the semi final and final round of both boys and girls competitions will be on April 30 from 10 a.m. until late afternoon. Further information can be obtained from Rajabhat Institute of Chiang Mai, Department of Student Affairs, tel. 053 412 544. 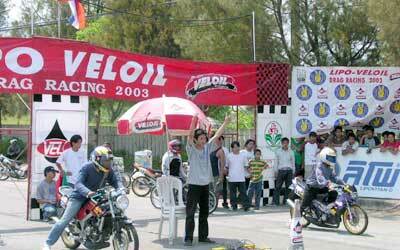 Lipo Veloil Drag Racing 2003 was held at the 700th Anniversary Sport Stadium on April 19, aiming to get together motor racing enthusiasts in Chiang Mai and neighboring provinces. This competition was managed by Team Body Shop Chiang Mai Thailand, which provided a lot of prizes. Competitions included junior racing, motorcycle bracket, car bracket, motorcycle open, 2WD car open and 4WD car open. A new boxing camp in Nan Province has been opened to help teenagers fighting drugs. It is located in Ban Hua Wieng Nue, Sub-District Phu Wieng in Nan, with Nan Governor Suwat Chokesuwatsakul launching the opening ceremony of the boxing camp against drugs. There are two boxing camps in the same area, with the well-known Sor Rungthongchai boxing camp training professional boxers and the amateur boxing camp Luk Kwan Nan. The amateur Luk Kwan Nan boxing camp provides boxing training courses and martial arts for young drug addicts from Kwan Nan Drug Rehabilitation Center. It is considered that the healthy boxing training could decrease the number of young drug addicts in the province and it is hoped that promising amateur boxers could eventually become professional boxers in the Sor Rungthongchai training camp. CH3, the oldest hash club (males) in Chiang Mai is picked up from the “ONON” pub (Moon Mueng Soi 1) at 16.00 once every 2 weeks. Pick up can be arranged from Fish and Chips shop as well. CSH3 is a mixed Saturday hash which is picked up from the H3 Pub on Moon Mueng Road every Saturday at 15.30. Pick up can be arranged from Fish and Chips shop as well. CUMH3 is a male hash which runs from the “ONON” Pub every consecutive (from CH3) Tuesday. Pick up is at 16.00. BH3 is a female hash (Harriettes) that runs once a month on the last Sunday of the month. It’s great fun and you surely get value for your money plus you get to meet all the long-time expats here! A couple more interesting things that I came across this week talking about the big risks in modern society at large. As weight increases so too does health insurance costs, reports a study in the January/February issue of the American Journal of Health Promotion. A study of 178,000 workers, retirees and family members of the General Motors’ health care plan found that overweight and obese people spend up to $1,500 more each year on medical bills compared with people of healthy weight. The researchers analysed medical costs in relation to individual’s weight. As weight increased, so did medical costs. Asian people appear to be particularly at risk because they have a tendency to collect fat in the stomach area, where it is thought to have the most significant impact on health. In the USA the percentage of black women with morbid obesity - a BMI of 40 or more - has doubled in less than a decade to 15%. Overall 6.3% of US women - that is one in 16 - are morbidly obese. The World Health Report 2002 estimated that more than 2.5 million deaths annually are weight related and forecast this could rise to 5 million by 2020. Deaths directly related to obesity have been estimated at 320,000 a year in Europe and more than 300,000 in the USA. Please bear in mind that the calculation of BMI does not take into account an individual’s muscularity, as, if you carry a lot of muscle for your height BMI alone will indicate that you are overweight, etc. A measure of body fat percentage will help add clarity to it but the best measure is a specific gravity test as errors in measurement are greatly reduced over the rather inaccurate body fat test. So, if you get a number greater than 25 on the BMI don’t be disheartened, get a second or qualifying opinion from a registered professional. Regular exercise and healthy eating will reduce a high BMI, with good advice and qualified supervision. 2nd corrected copy - I have fouled up this time (blame it on Songkran or should it be Sang Som?) and stuffed up the scores of Blue Sky & Hiss & Slither and the home points for Home To Roost. I hope this is the LAST correction. 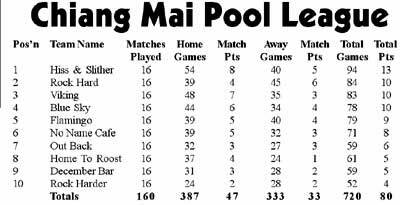 Sorry for the upset to some that this may have caused and Congratulations to Hiss & Slither on winning the league - John. The present season will end on 2 May with the end of season prize giving at the Hiss & Slither Bar on 9 May. The new season will commence 6 June. Entry fee remains at 400 baht to be paid to John at True Blue / Out Back no later than 24 May 03. Any proposed changes should also be forwarded (fully worded, not vague suggestions) to John by 02 May. I trust that everyone has survived Songkran with a “sigh” and a thought. The thought? “Thank goodness we made it through another Songkran.” Surviving Songkran is something, as it killed more than SARS and The War in Iraq. Gosh what a great holiday. The champion Weasel of the Week award this week goes to the Honorable Dr. Jose’ Sulaiman of the WBC. Lennox Lewis is going to fight Kirk Johnson on June 21 but the WBC says Lewis must fight Vitali Klitschko, well kinda. “The WBC does not want to strip Lennox of his title. He is the pride of the WBC,” said Sulaiman. “If Lennox fights Kirk Johnson without an agreement with Vitali, perhaps we wouldn’t sanction the fight, but we wouldn’t strip him.” You not sanction a fight and collect say $100,000 USD? Dr. Sulaiman, I was born in the morning but it didn’t happen to be this one. Brentford, West London will be the site tomorrow of Scottish Dave Stewart’s next fight. Dave’s in against Nigel Senior for the British Masters title in his first 10 rounder. Initially Stewart was to box Chill John over 8 rounds, but he pulled out. Then a quality fighter called Darren Melville for the vacant British Masters lightweight title (10 rounds). He pulled out too. Nigel Senior, the current Masters Champion, was vacating the title to fight a Yank who also pulled out. Stewart writes, “Thus Senior is defending against me. Should have no problems. Then it’ll be back to Thailand to celebrate with my comrades at Scot’s Corner!” I’ll drink to that. WBC superfeatherweight champion Sirimongkol Singwancha was named the best Thai professional athlete of 2002 at the Sports Day function. This award was organized by the Sportswriters Association of Thailand. No, of course I’m not a member, being a farang and all. “And all” covers a lot of ground. A little background on Sirimongkol. He captured the vacant WBC 130-lb title in 2002 by destroying Kengo Nagashima in 2 in the Land of the Rising Sun and Falling Yen. His first defense was against former WBA champ Yong-Soo Choi in Tokyo where he got the decision. “Now, he’s planning a title defense against WBC#1 Jesus Chavez (39-2) within 6 months.” Planning and getting it done are two different things. From a financial standpoint the fight would probably have to be in the USA. That’s where the money for Chavez would be. Chavez got the #1 spot in the WBC ranking after he KO’d Carlos Gerena (38-4) in 6. WBC bantamweight champion Veerapol Sahaprom (40-1) will change the challenger in his 10th title defense bout on May 1. Nicaraguan Julio Gamboa was denied by the WBC because he was defeated by Jose Luis Valbuena in his last bout. “Veerapol’s new opponent could be the WBC Latin American bantamweight champ Hugo Dianzo of Mexico.” That is maybe true but patently silly as most of Veerapol’s defenses have been. Dianzo is the #14 ranked by the WBC. Being called credible would be a stretch of gigantic proportions. If Veerapol is ever going to gain the standing of a great champion or heck even a good one, and the money that follows, he’s going to have to fight someone that’s still breathing. Who? How about WBC #1 Toshiaki Nishioka (23-3) or WBA Champion Johnny Bredahl (53-2) of Denmark? Stop the press: Hugo Dianzo (29-8) will be the one challenging WBC bantam champ Veeraphol Nakhonluang (40-1) in Bangkok May 1. Dianzo lost a very controversial decision to then-118lb champ Paulie Ayala two years ago in Ft. Worth, Texas and since has gone 3-2. The native of Mexico is computer ranked #31 while Veeraphol is #2. “Just another payday.” We now return you to our regular column. “As a boxer, Mohammed Yusif Mohammed (5-2, 4 KO’s) is nothing special. His boxing skill is average, similar any other boxer on his level, with a hit and run strategy. What makes ‘The Basra Boy’ so unusual is that his homeland is war-torn Saddamless Iraq. Mohammed, 24, was born in Basra City, Iraq and trained in Al-Basra Gymnasium.” Like many Iraqis he hauled “A” before the war started and uses a hit and run strategy. The latter didn’t work for him or his country. He’s been in Bangkok for 6 months living and training. Guess six months isn’t long enough to learn that Thai fighters should not go to Indonesia to fight. He lost a UD (95-92, 96-93, 95-93) over 10. Handlers for Olympic super heavyweight Gold Medallist “Fraudley” Harrison seem desperate to get their meal ticket back in favor. They claim, in a press release that they “are open to accepting a challenge from former WBC heavyweight champion Frank Bruno and await a firm written proposal. The fight would have mass appeal with the British public and Audley is ready to accept the challenge,” said Harrison’s business manager. Now would that be the same Frank Bruno with the body by Adonis and the chin by Waterford? The same Frank Bruno that seven years ago was KO’d in 3 rounds by Mike Tyson? The same Frank Bruno that lost his bottle? If so and the “the fight would have mass appeal with the British public” then there is something rotten in British sport. “You’ve got to be joking.” How about them apples?